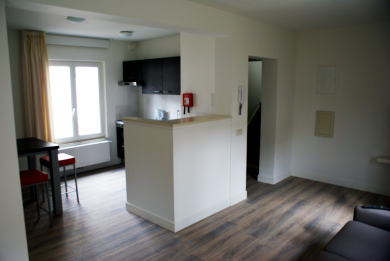 Ample, modern and fully furnished 1-bedroom apartments with a floor area of approximately 60 m². In addition to a spacious living room with an open plan kitchen - perfect for cooking enthusiasts - the apartment also has a separate bedroom for two persons and a luxurious bathroom with rainshower. Each apartment also has a separate storeroom in the basement. These apartments are very well suited for 2 persons. The apartments are located on the first, second and third floor. The all-in rental price starts at € 1250 per month. If you're interested in one of these apartments, please fill free to contact us .